IntelyCare helps optimize a workforce through smart matching of nurses and local facilities, reducing burnout, streamlining administration, and improving care. We know it’s not always easy to find a nurse or CNA to fill a shift. We also know it can be a hassle to have to pick up the phone and call an agency. We figured it would just be easier to automate the task online. So, we made it incredibly simple to request what you need and sit back and relax until a high quality nurse or CNA picks up your shift. Curious to see how it works? All of our nurses and CNAs have their own IntelyCare profile page: profile picture, personal info, experience, and full credentials and certifications such as nursing license, driver’s license, CPR certification, and training courses completed. We built a proprietary system that will automatically check the state databases every week to verify the status of nurses’ and CNAs‘ state licenses. We’re the only company that automatically verifies licenses every week. If a state agency (Dept. of Public Health) or The Joint Commission ever stops by, you have all the credentials for all IntelyCare staff – past and present – with just a few clicks in your personalized online portal. With our live mobile platform within every nursing station, you never have to worry about who is coming into your facility. Get real-time access to view personnel changes, view current certifications, and even see the picture and bio of care providers before they arrive. 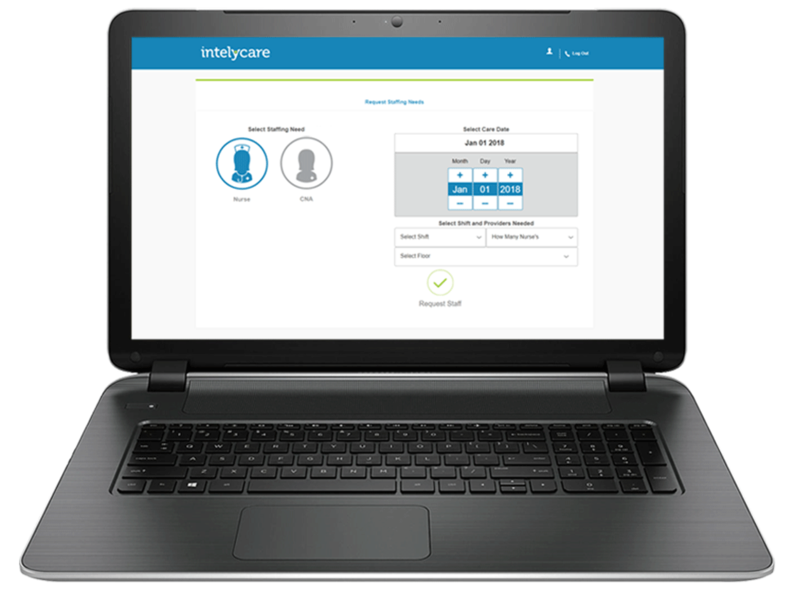 We’ll install a tablet at every nursing station in your facility so all floor staff will know who to expect from IntelyCare. Our invoices are easy to read and loaded with full back-up information. Every Tuesday we’ll send you an email and an invoice for the previous week, along with the signed check-in/check-outs from a charge nurse and validated GPS location of the nurse or CNA. When our nurses and CNAs say they will be there, they’ll be there. We have multiple systems in place to assure you don’t experience a no-call, no-show. Everything from same-day text confirmation from our care providers to GPS monitoring while they’re on their way. Our care providers will be there on time and ready to work. If there is training you want our care providers to have that isn’t already part of our current offering, then just let us know – we are constantly building and updating training to make sure we’re providing our nurses and CNAs with the most current and relevant content.